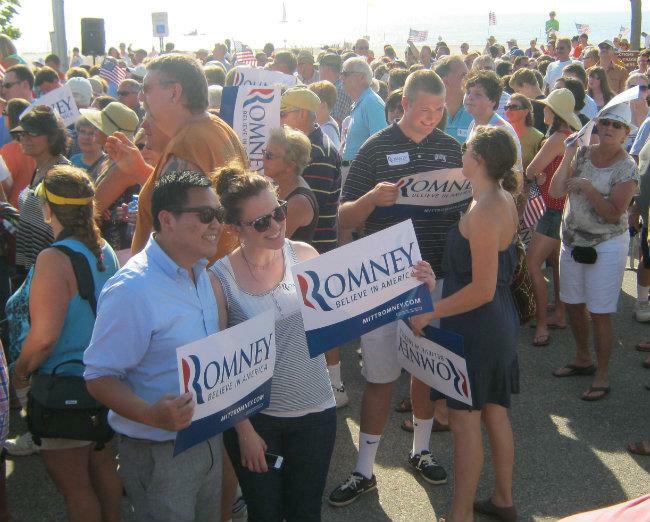 Mitt Romney at Holland State Park Tuesday evening. Thousands gather for the event Tuesday evening. Supporters hold hand-made signs that spell out Mitt. Protestors came all the way from Detroit to rally against Mitt Romney in Holland. “This is a defining time for this country. That’s a place where the president and I agree,” the Republican Presidential candidate said in Holland Tuesday night. 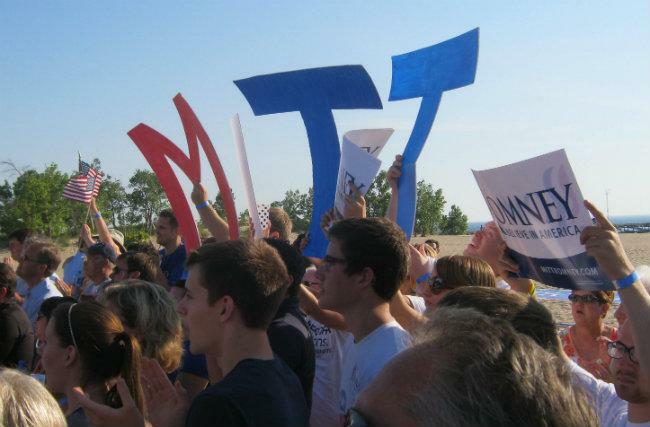 Thousands of Romney supporters in shorts and sandals rallied on the shore of Lake Michigan at Holland State Park. Romney’s 20-minute long speech focused on how important a strong American economy and military are to the rest of the world. “American strength is the best ally peace has ever known. We must strike for a strong America,” Romney said. Romney says the president’s health care overhaul is hurting small businesses. He says the economy is being dragged down by uncertainty about the federal debt. He says he worries that the United States is headed on the same path as Greece. After Romney’s speech, Mary Winkle, a supporter from Allegan, said she’s excited that change could be around the corner. "Americans can take care of themselves if you get out of our way. And that’s what we need to do: get people working again, get small businesses going, bring down the deficit, and we’ll be back on our feet,” Winkle said. Romney hopes to win his native state in November. Winkle admits that’ll be tough. Michigan hasn’t voted for a Republican President since 1988. Hudsonville resident Ruth Hoeksema sports a large Mitt Romney sticker on her t-shirt. “Well…” Hoeksema pauses when I ask her why she supports Romney. “He’s not my first choice, but I’m going to vote for him because I’m not going to create a wedge and give the job to the incumbent,” Hoeksema said. She doesn’t like President Obama’s new policy that will allow younger illegal immigrants with no criminal record to stay in the country. Hoeksema’s grandparents legally migrated from Holland - the country. She thinks it’s only fair that everyone follow the same rules. She’d also like to see the smaller government and economic growth Romney promises. About a mile away from the park, retired school teacher Manila Freeman lead about 50 protestors who were bused in for the event from Detroit. “We’re all volunteers, so nobody has been paid. We wanted people to know Romney is not the candidate for America,” Freeman said. Freeman, a retired Detroit Public Schools teacher, says she worries about her pension under a Romney administration. She says Romney doesn’t pay his fair share of taxes under the capital gains tax. She says he’s out of touch with normal Americans. “He’s just not his father,” Freeman said, shaking her head in disgust. Romney was born in Michigan. His father was Governor of Michigan from 1963-1969. Romney hopes to win over his native state. Michigan hasn’t gone for a Republican presidential candidate since 1988. Republican presidential candidate Mitt Romney wraps up a day-long campaign swing through Michigan tonight with a rally at the Holland State Park on the Lake Michigan shoreline. 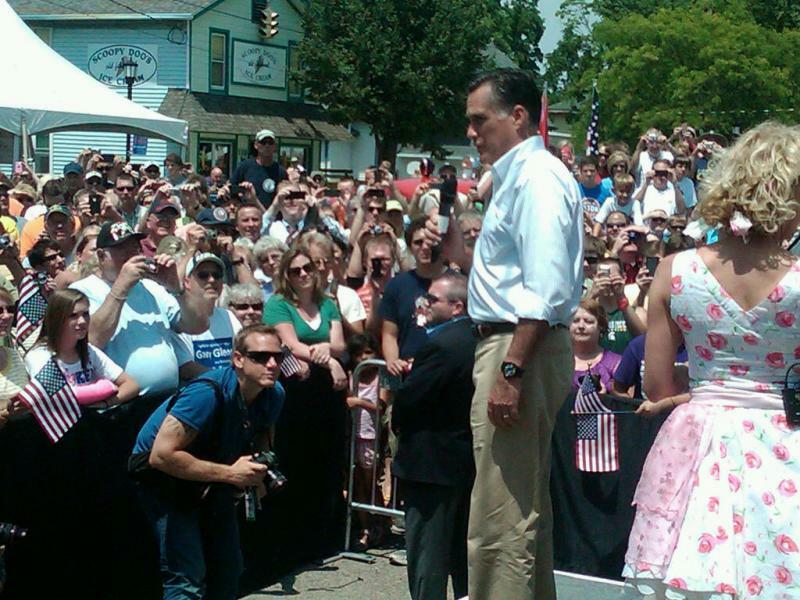 Romney began the day in Frankenmuth, where he went on the attack against President Obama on the state of the economy, the new health care law, and energy policy. Romney acknowledged Michigan’s economic recovery and said he would do the same for the rest of the country if he wins the election. He opposed federal aid for the Detroit auto companies that are still the dominant force in the state’s economy. Romney says he can be the first Republican nominee in 24 years to win Michigan. 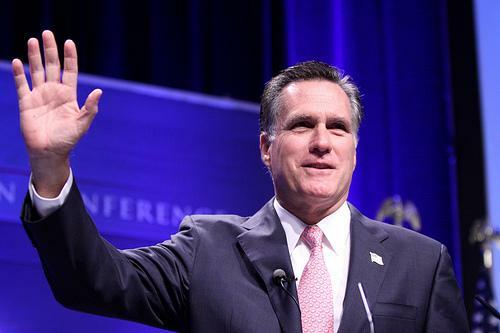 Romney was born in Detroit and is the son of former Governor George Romney. 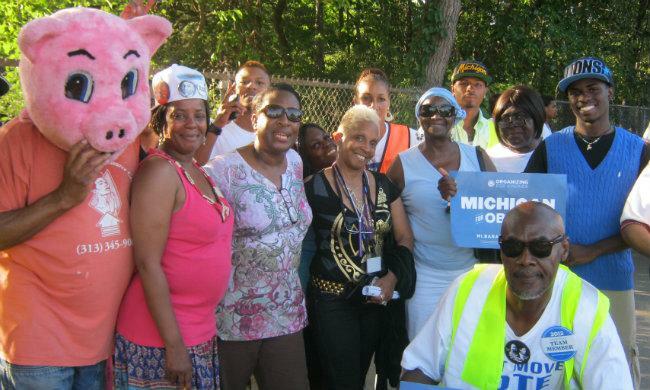 Protesters also showed up at the Romney campaign stops but were kept at a distance. Democrats sponsored their own bus tour of the state yesterday. "If you listen to a Mitt Romney speech, you’ll hear almost nothing about his plans, almost nothing about his time as governor of Massachusetts, and almost all about distorting the President’s record," said Brad Woodhouse of the Democratic National Committee. From Frankenmuth, Romney went to DeWitt, Mich.
Republican presidential candidate Mitt Romney will be in Michigan today to wind up a tour of battleground states. The states were all won by President Obama four years ago, and Republicans need to flip one or more of them to win the White House. Republicans like their chances in Michigan. Romney and his wife were both born here. His father served as governor. Some recent polls suggest the state’s a toss-up. But no Republican presidential nominee has won the state since 1988, and Romney opposed much of the auto bailout that’s credited with leading the state’s economic recovery. 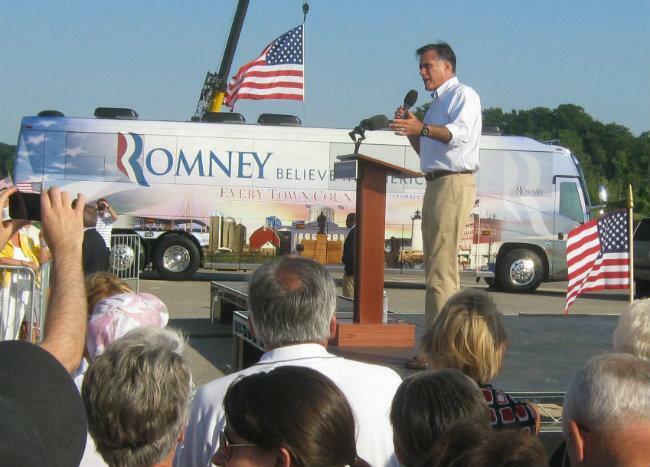 So Democrats sponsored their own bus tour with stops not far from where Romney will appear. “One of the things we wanted to do is greet Mitt Romney with some headlines about what we think his policies will do to Michigan, and so we wanted to get out ahead of him," says Brad Woodhouse of the Democratic National Committee. The liberal group MoveOn.org plans have protesters waiting for Romney at each stop in his tour, which will wind up with a rally near Holland on the Lake Michigan shoreline. George Orwell once said that those who control the past, control the future. If you can revise history to fit your point of view, it gives you power. So, it should be no surprise that presidential candidates are struggling over some recent history - the auto bailout. A major change in U.S. immigration policy is getting a mixed reaction from advocates for undocumented immigrants in Michigan.